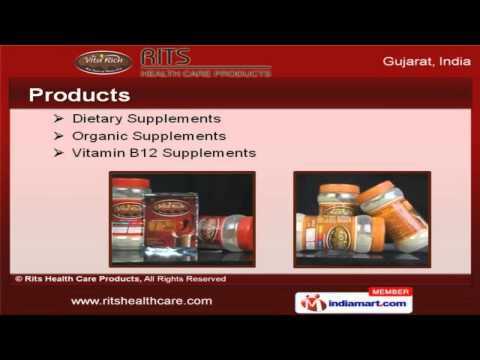 Welcome to Rits Health Care Products, Manufacturer and Supplier of Dietary and Organic Supplements. The company was established in 2013 at Surat. Rigorous quality inspections and Customer centric approach make us different from others. Ethical business policies, large production capacity and Timely delivery schedules make us the first choice of our clients. We offer a wide assortment of Dietary, Organic and Vitamin B12 Supplements. Our Multivitamin Powders, Vitamin B12 Products and Energy Supplements are best in the industry amongst others. We offer Nutritional and Vitamin Supplements that are in huge demand across the global markets. Vitamin D3 Products and Vegetable Masala offered by us are some of our best selling products. Along with that we offer Dehydrated Shitakke Mushroom that are available at industry leading prices. We also provide Dietary Supplements for Fitness Centres that are reckoned all over the world for their superb quality.